“A Boulevardier is actually my favorite cocktail,” Nelson says. 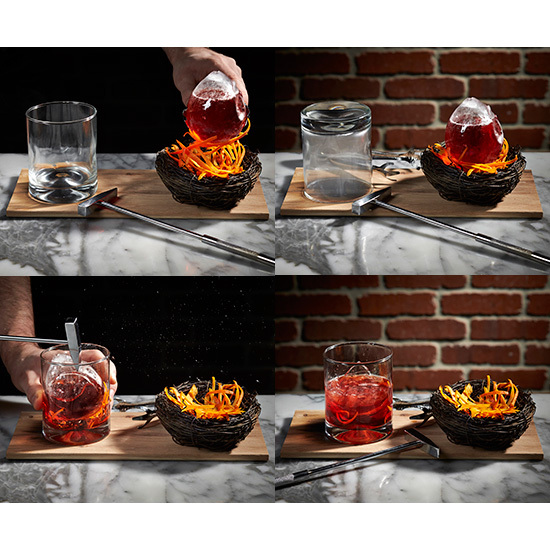 “I figured if I was going to put that much effort into a drink, I was going to make something I loved.” Before serving the cocktail, Nelson torches a plank of cedar wood and extinguishes it with a rocks glass, which fills with flavorful smoke. He flips over the glass, adds the frozen egg and smashes it with a hammer to release the cocktail. After that, it’s ready to drink. Jackson 20 will offer the For the Birds cocktail through Easter, after which Nelson plans on switching to easier-to-produce cocktail spheres.